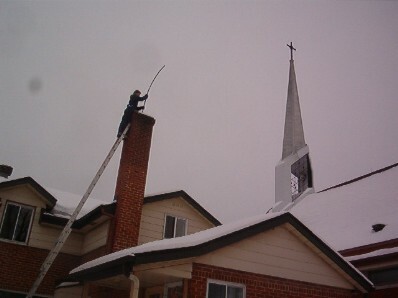 Precision Chimney offers a wide range of chimney sweeping services. We sweep Oil Furnaces, Wood Furnaces, Wood Stoves, Inserts and Fireplaces. We do complete chimney sweeps, that means we sweep the chimney flue and then come inside your home to clean the smokechamber, and remove the buildup which accumulates on the smoke shelf. Our Chimney sweep service is quick and very clean. We use drop sheets to protect your floor and furniture. A vaccum controls any airborne dust. The sweep also includes a visual inspection of the chimney's brickwork, flue and inside the smokechamber and fireplace. A free estimate is also included if we notice any damage.